FSBCS South Africa Mission Blog: Greetings from South Africa! Our first full day here at Hope Baptist has been a whirlwind of activity! Most of us were so tired that we slept through a powerful thunderstorm last night. Can you say jet lag!! We started the day with fellowship, prayer and a spectacular devotion from our amazing Edith....she had a beautiful reminder for us to keep our focus on Jesus! Sarah, our hostess at the bed and breakfast made a breakfast fit for kings and queens to get us fueled up and ready to share our message of growth and hope! We arrived at the church and were so pleased to find there were many many people ready to learn and grow as leaders in the Christian Community. Worship like I have never experienced led off the day....such uninhibited joy and praise in song and dance!! Pastor Julius led introductions of some of the team prior to well received plenaries from the head of PEN on campus at Hope, Dr. Marinda Van Niekerk, followed by Mitch McDonald and then Mona McDonald. After lunch the team all broke up to teach our assigned workshops which were broken up around the campus. Each of the workshops was well attended with great participation and many questions. Many of the team members were able to minister to one or more of the attendees from their session with individual questions, and to delve a bit deeper into the subject matter. 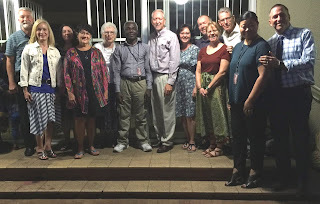 After some more time in worship, many attendees participated in a graduation ceremony from a pastoral training program that Pastor Julius is championing here - we even saw a marriage proposal (she said YES). One of the graduates of this program, is a man from Nigeria who was first introduced to Christ through an eye glass clinic with last years mission team! and believer that came to Christ through the eye-glass clinic. We ended our day with dinner at a local restaurant as a team. Now it is late, it has been a long day, and we are weary....but we are excited and encouraged! We have been received like family, the children and the jubilant worship have captured our hearts. Miss Edith and Mona even took an opportunity to show off their dance moves (yes there is video). God is moving and shaping lives here, the church is vibrant and striving to seek the lost for Jesus! Julius and Cintia and the church are a beautiful picture of loving on this community as Christ commanded. We are proud and humbled to play even a small part of helping advance God's kingdom here. Tomorrow starts early, so it is time to slow down and thank God for what He has done today, and all He has planned for the rest of our trip. Goodnight from South Africa! 2018 Trip Almost Ready to Launch!